LOCATION.--Lat 42°06'07.3", long 74°18'39.2" referenced to North American Datum of 1983, Ulster County, NY, Hydrologic Unit 02020006, on left bank below Ox Clove, 10 ft downstream from bridge on State Highway 214, and 1.8 mi upstream from mouth, at Chichester. PERIOD OF RECORD.--Annual maximum only--1997, February 1997 to current year. Prior to October 2006, published as "near Phoenicia" (01362380). REVISIONS HISTORY.--WDR NY-99-1: 1997(P), 1998(P). GAGE.--Water-stage recorder, crest-stage gage, and concrete control. Datum of gage is 947.52 ft above NAVD of 1988. Prior to Aug. 7, 2007, at site 0.5 mi downstream at datum 55.48 ft lower. EXTREMES FOR PERIOD OF RECORD.--Maximum discharge, 14,300 ft³/s, Aug. 28, 2011, gage height, 9.61 ft, from rating curve extended above 2,900 ft³/s on basis of runoff comparison of slope-area measurement at gage height 7.92 ft (present site), from floodmarks, at site 250 ft upstream (drainage area, 26.9 mi²); maximum gage height, 10.33 ft, Apr. 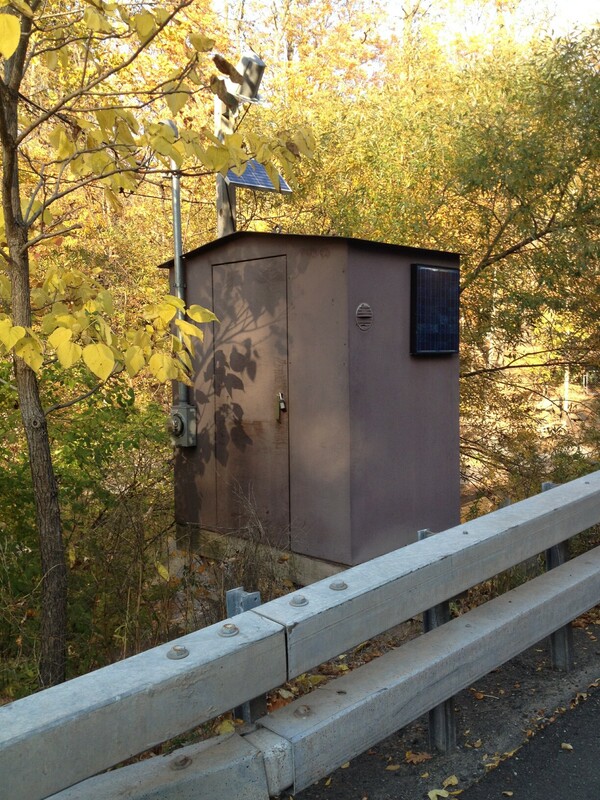 2, 2005, site and datum then in use; minimum discharge, 3.1 ft³/s, Oct. 3, 2014, gage height, 2.10 ft, result of regulation caused by construction work upstream of gage; minimum gage height, 1.96 ft, Aug. 31, Sept. 8, 9, 10, 2001, site and datum then in use. EXTREMES OUTSIDE PERIOD OF RECORD.--Maximum discharge, 7,600 ft³/s, Apr. 4, 1987, by computation of slope-area measurement at site 250 ft upstream (drainage area, 26.9 mi²). Discharges for other floods by computation of slope-area measurements at site 1.8 mi downstream (drainage area, 33.3 mi²), are as follows: 6,560 ft³/s, Nov. 25, 1950, and 4,460 ft³/s, Apr. 5, 1952. PERIOD OF DAILY RECORD1.--SUSPENDED-SEDIMENT CONCENTRATION: November 2010 to current year. SUSPENDED-SEDIMENT DISCHARGE: October 2011 to current year. REMARKS1.--Turbidity data are collected every 15 minutes using an in situ turbidity probe located in the same pipe with the automatic sampler intake tubing which is a 2 inch diameter galvanized steel pipe extending 3 ft from the left bank. Daily suspended-sediment load and concentration are derived from a regression equation relating turbidity to suspended-sediment concentration. EXTREMES FOR PERIOD OF DAILY RECORD1.--SUSPENDED-SEDIMENT CONCENTRATION: Maximum daily mean, 2,860 mg/L, Dec. 1, 2010; minimum daily mean, <1 mg/L, on Aug. 24, Sept. 1, 24, 28, 29, 2014. SUSPENDED-SEDIMENT DISCHARGE: Maximum daily, 8,860 tons, Sept. 18, 2012; minimum daily, <0.01 tons, Jan. 15, 16, 17, 2012, on many days in September 2013.